Take an artist, add some technologist, toss in a healthy tablespoon of passion and you have an educator wild about combining 21st Century tools with art to create great things. Art educator Cathy Hunt is a product of those ingredients and she has a great story to share. Many of see most art as a physical process that does not or should not occupy space in the virtual world. Cathy does not see it that way. Combining her fantastical tech and art skills, Cathy explains how, and often on the iPad, the virtual and physical world can converge to create new art forms that empower and excite today’s students. In addition, Cathy is one of those educational leaders who loves to share and spread her ideas to others. A casual glance at her website reveals her boundless energy for providing professional development sessions, writing books, suggesting lesson ideas, creating videos and simply sharing student work examples. 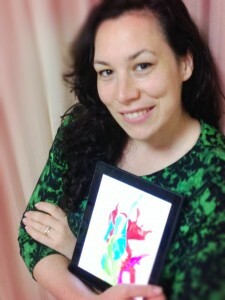 Cathy is an educational consultant, presenter, author and experienced Visual Art teacher using a 1:1 iPad classroom for diverse students in years 6-12 in Australia. Keen to share her knowledge and experience in transformational learning in the art room, Cathy created ‘iPad Art Room and began a website of the same name as a home base for educators to engage with innovative ideas, resources and technology for learning.